Use the built-in Everyone account if this group does not exist. In order for the Déjà Vu X3 COM+ Server to work correctly, you must prepare the server computer before installing the COM+ Server. The necessary steps are described in this section. On Windows Server 2003 and 2003 R2, enable the option Enable network COM+ Access in Control Panel>Add or Remove programs>Add/Remove Windows Components>Application Server. 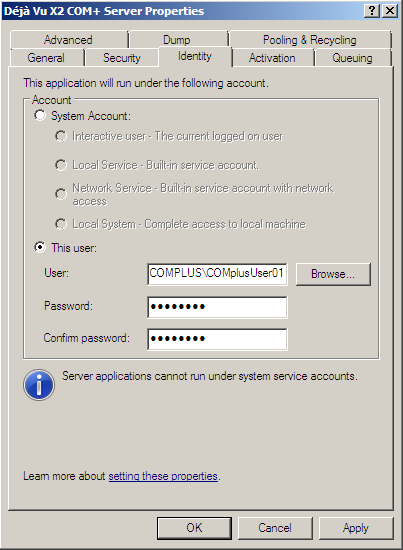 On Windows Server 2008, 2008 R2 and higher, go to Control Panel>Programs and Features>Turn Windows features on or off, and in the Server Manager window that appears, make sure that the Application Server role is installed and that its COM+ Network Access role service is installed. If you are using a firewall other the OS’s own, read this article to find which ports must be enabled; if you use Windows Firewall but find that the COM+ Server is not accessible, check the Windows Firewall rules to make sure the necessary ones were enabled. If the computer that will run the COM+ Server and the computers that will run the clients are members of an Active Directory Domain, the setup process before installing the COM+ Server is made significantly simpler. The following describes what you have to do the configure your server to run the Déjà Vu X3 COM+ Server if it is a member of an AD Domain. Select the name of the Windows/Active Directory user group that corresponds to the translators (e.g. TranslatorsGroup), and give this group “Full control” access rights. This group should be created on the domain controller and should contain all the users that need access to the shared folder. 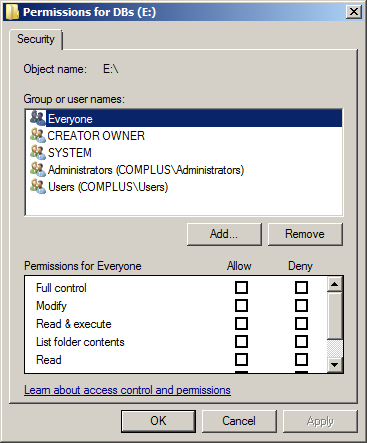 If no such group exists, then select “Everyone” security principal and give it “Full control” access rights. Give the Network Service account (on the local server – not a domain account) “Full control” access rights. Install the Déjà Vu X3 COM+ Server component. The Déjà Vu X3 COM+ Server component is downloadable from here. On the Start menu, point to Settings, click Control Panel, double-click Administrative Tools, and then double-click Component Services. Right click on My Computer and select the Properties menu option. 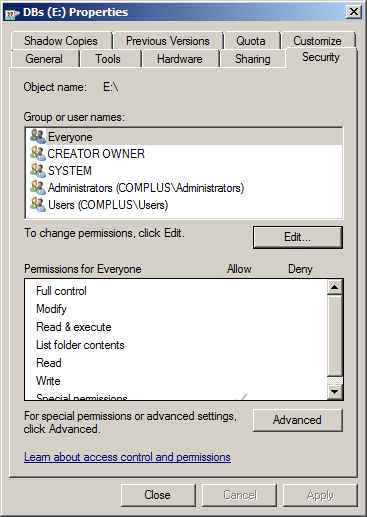 Under Launch and activation permissions, click Edit Limits:. 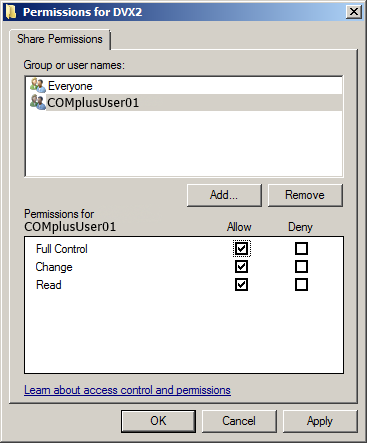 Allow the user group the permissions Remote activation and Remote launch. Open the Component Services dialog. Then, go to Console Root>Component Services>Computers>My Computer>COM+ Applications. Find the application called Déjà Vu X3 COM+ Server, right-click on it and select Properties. Select the Pooling and Recycling tab. Set the Pool size value to the number of clients (i.e. users of Déjà Vu X3) you expect to have. Bear in mind that the more concurrent requests the COM+ Server services, the more computational resources it will require. For this reason, we do not recommend that you set the Pool size value higher than what is quoted above. Setting up a server and several client computers to work with the Déjà Vu X3 COM+ Server is similar to what is done when you are setting them up in a Domain. However, since there is no central AD Controller to handle authentication you must configure each computer to recognize the user accounts of the users involved so that both the clients and the server will be able to talk to each other. In a normal setup, you will have several client computers connecting to a single server, each client will have a single user logged into their local user account, and the Déjà Vu X3 COM+ Server running in the server computer under a local user account. In order for the server to accept connections from the clients and to communicate with them, the Server computer must recognize the users that are attempting to connect to it. If there is no central AD Controller to handle authentication, this is achieved by making sure that there are local user accounts in the server with the same name and password as the local user accounts being used in the clients. Similarly, each client computer must have a local user account with the same name and password as the user account being used on the server to run the Déjà Vu X3 COM+ Server, so that the client computers will be able to communicate with the COM+ Server correctly. Window’s Simple File Sharing feature prevents windows from transmitting user credentials when attempting to read from or write to a shared location, which makes it impossible for the sort of authentication required by Déjà Vu X3 and the COM+ Server to work. Therefore it is necessary to deactivate this in all the computers that will be involved in the sharing of databases, that is, the server where shared databases are stored, and the computers running Déjà Vu X3. Select the account Everyone and give it “Full control ” access rights. If you prefer a more granular setup, you can add the individual client user accounts and grant “Full control ” access rights to each of them. Select the account Everyone and give it “Full control” access rights. If you prefer a more granular setup, you can add the individual client user accounts and grant “Full control” access rights to each of them. Give the user account used to run the Déjà Vu X3 COM+ Server “Full control” access rights. If it is not present yet, add the Everyone user group. 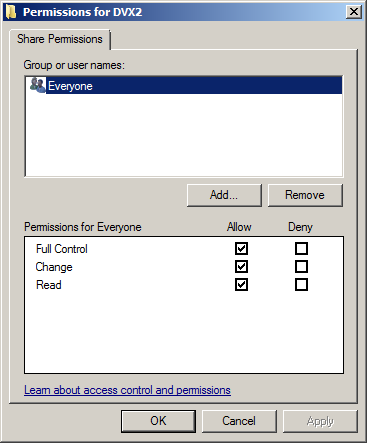 Allow the user group the permissions Remote activation and Remote launch (if you prefer a more granular setup, you can add the client user accounts individually and set the necessary permissions for each). Open the Component Services window. Go to Console Root>Component Services>Computers>My Computer>COM+ Applications. Right-click on the Déjà Vu X3 COM+ Server application and select Properties. Check the This user: checkbox. Go to Administrative Tools>Component Services, and then to Console Root>Component Services>Computers>My Computer>COM+ Applications, find the application called Déjà Vu X3 COM+ Server, right-click on it and select Properties.